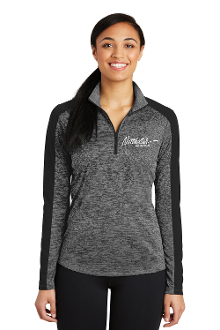 This lightweight pullover locks in color, wicks moisture, resists snags and has an amped up color-block look. Color: Grey-Black Electric/Black. 4.1-ounce, 100% polyester yarn-dyed jersey with PosiCharge technology / Removable tag for comfort and relabeling / Cadet collar / Reverse coil zipper / Colorblock on shoulders and sleeves / Set-in sleeves / Open cuffs and hem.